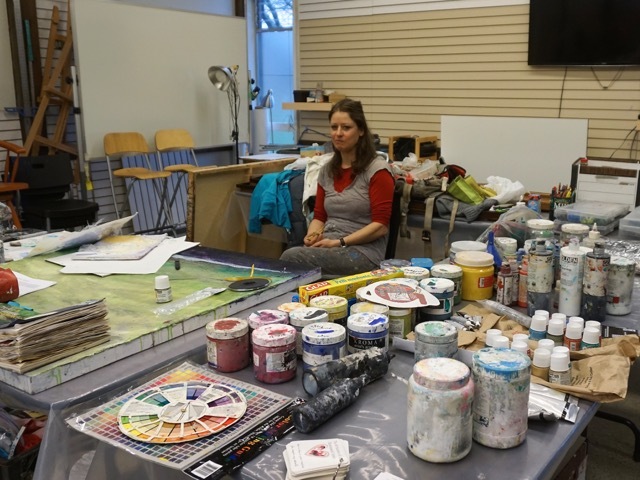 Three day workshop this past weekend with the South Delta Artist Guild. 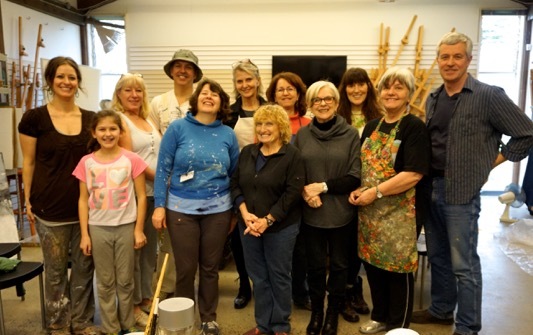 Wonderful group, almost everyone completed a large mixed media a abstract painting. Thank you Linda Bell for photos. Thank you for the beautiful flowers and card at the end of it! Beautiful! 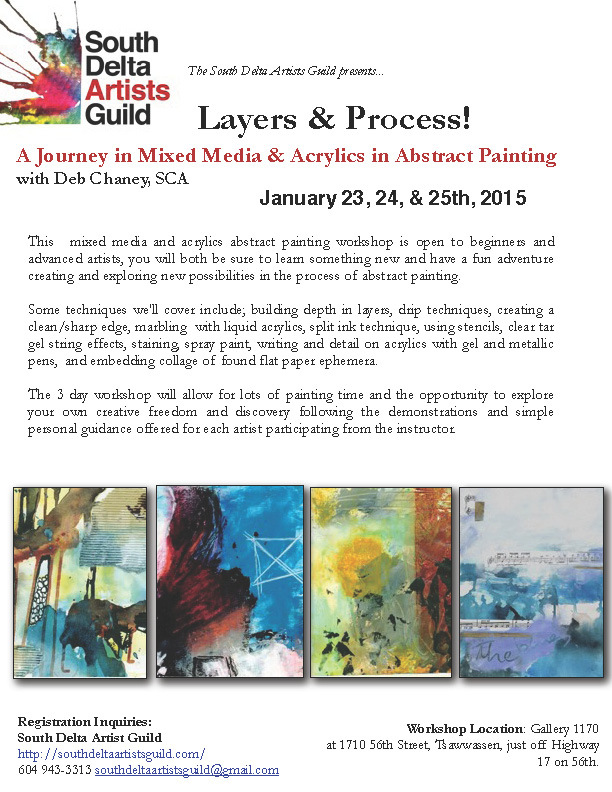 Upcoming workshop offering – Jan 2015! 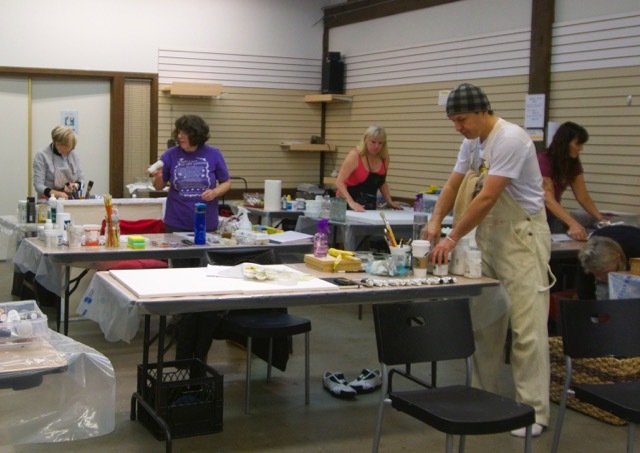 Workshop Description: Working on one large painting and several small pieces, in this abstract mixed media & acrylics painting workshop students will learn techniques such as; creating texture, lifting and staining, basics in glazing with polymer mediums, and removal techniques to create depth. 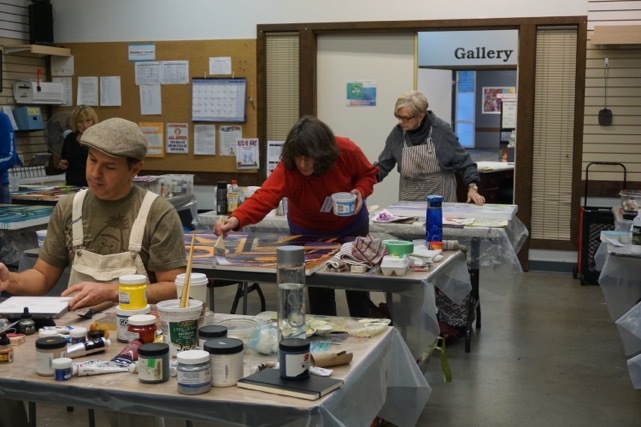 We will also play and experiment with the student’s chosen acrylic mediums and acrylic pastes – such a as modeling paste, matte medium, pouring medium. 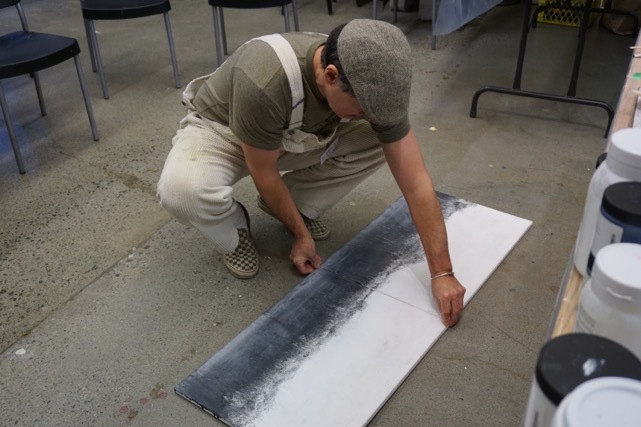 The workshop will allow for lots of painting time, the support to complete one large painting, and the opportunity to explore your own creative freedom and discovery following the demonstrations and simple personal guidance offered for each artist participating from the instructor. 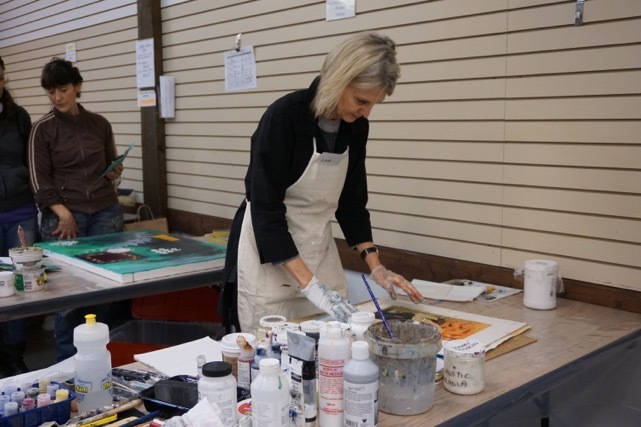 About the instructor: Deb Chaney has been teaching acrylic mixed media abstract painting for the past 5 years and painting, exhibiting and selling her artwork for the past decade. 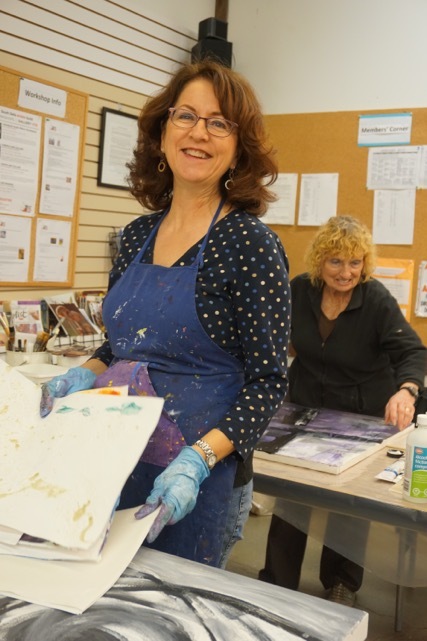 Her teaching philosophy is to illuminate the artist within, inspiring individual personal creative empowerment. Just met Greg Smith from Rookie Blue (TV) !!! Coolest thing ever happened today! I just met Greg Smith, star of the Canadian TV series Rookie Blue (Officer Dov Epstein), while walking downtown Vancouver today. (pictured above, last officer on the right) We spoke briefly as we crossed the street together and he was so kind and down to earth. I told him that I loved the show (I do!) 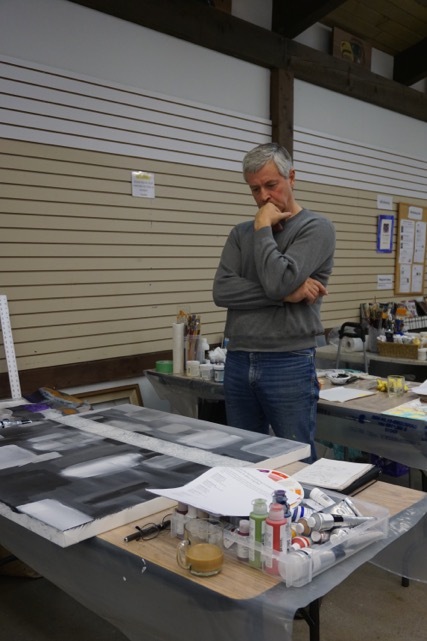 and that my dream was to have my original art used in TV and Film on sets. I then asked him if it would be OK for me to give him my card? 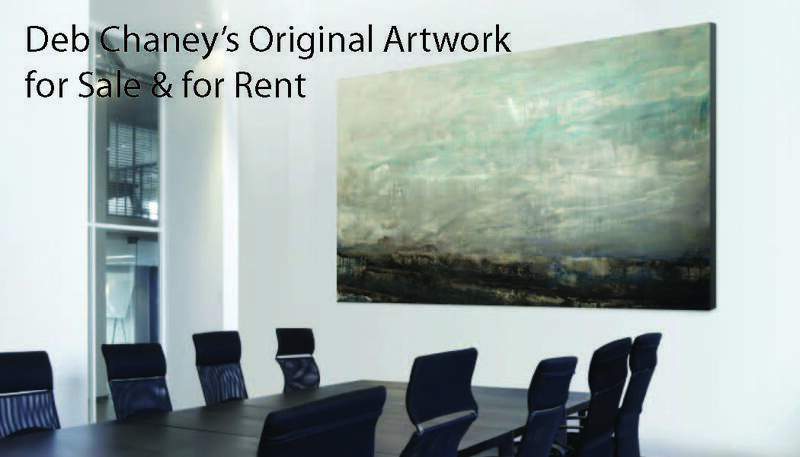 Moment of truth: My hands were shaking as I handed him my business card showcasing my large ‘Storming’ abstract landscape piece! (pictured below). Greg, if you’re reading this, thanks again for being so cool and for taking my card to support my dream of my artworks in TV and Film !!! Gratitude 2015!! !